DU Meter 6.03 is an award winning utility from Hagel Technologies that provides an accurate account of the data which is flowing through your computer's network connection at any given moment. This readout is presented in both numerical and graphical format, in real time. DU Meter 6.03 includes extensive logging facility, flexible events system, and more. 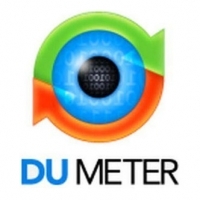 DU Meter works with virtually all types of network connections: phone modems, DSL, cable modem, LAN, satellite, and .... .
- Full compatibility with Windows 8 and Windows Server 2012. - Taskbar integration mode is fully rewritten. DU Meter is now very unobtrusive, tastefully blending with your Windows taskbar. - Totals notification balloon provides most important bandwidth usage statistics at a glance. Just hover your mouse over DU Meter taskbar band. - Totals and reports updating can be suspended automatically, based on the currently connected Wi-Fi network. Useful if your laptop's bandwidth usage caps are only applicable to one location.